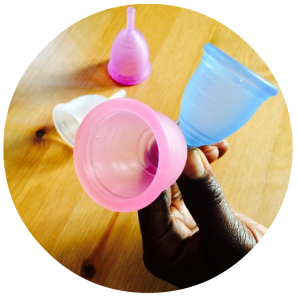 What is a menstrual cup? And what makes them so special? Cups are a fantastic innovation and one of the greatest unsung inventions of the 20th century! Cups are an ingenious alternative to pads, tampons, or other menstrual products. They are usually made of soft medical-grade silicone, and crucially – they can be reused for up to 10 years! This means for each cup user: a whole decade of being able to manage her period reliably, effectively, and safely, with confidence and dignity. In the UK, a woman can spend approximately £2500 on disposable menstrual products over the course of her lifetime – using a cup results in spectacular financial savings in the long term. Contrary to using pads or tampons – using a cup means that for 10 years the user will produce no solid waste from her period for landfill, incineration, or other means of disposal, resulting in significant environmental benefits. Because the best cups are made of the highest quality medical-grade silicone they are safe to use and do not have the association with toxic shock syndrome or vaginal infections that tampons do. If you’d like to try using a cup yourself or gift one to someone else visit our shop to buy one from us – your purchase will support our work in low-income countries, save you money in the long run, and help the environment by reducing the amount of menstrual products going to landfill.